Laughter and gasps following in his wake, he strode down the hallway of the shiny new building, wearing one of the cobalt blue tee-shirts that had been given to the entire student body on the opening day of the brand new school. Typical of such gear, the shirt bore the name of the school above the fierce snarl of the school mascot. I think of that student sometimes when I encounter people who say they believe in God but that they don’t believe in “organized religion.” Like him, they make sweeping statements about the institution as a whole because it’s easier than facing the reality that all institutions, including churches, have their benefits and their drawbacks. It’s not easy to find a church that views God as inclusive rather than exclusive. And that, I understand. Each time I’ve moved, it’s taken a long time for me to find a community of faith that can somehow manage to embrace Christianity without insisting that only Christians have the ear of God. But they can be found. Last week my church hosted a young Jewish musician, Noah Aronson, who told us it was his first time ever to play in a church. Instead of a sermon, the service alternated between music and dialogue between our pastor and this young man, who is studying to become a rabbi. Hearing about how his own faith journey is so similar to our own was a joy, and he enriched our worship. Prior to moving to our current home, we joined a church that shared sacred space with a Jewish congregation. Twice a year, our minister and their rabbi engaged in a “pulpit exchange.” We had a joint Thanksgiving service for the single holiday we both share. And several times we hosted panel discussions with a minister, a rabbi, and a Muslim imam to explore the commonalities of our faith. It’s easier to work for positive change in the world if we join our efforts with others. And it’s healthier to be a part of a group where people aren’t afraid of the messiness of disagreement. We have to understand that no matter what congregation we decide to embrace, we as individuals will find things we don’t agree on—things that we wish were different. But if we want to take part in something bigger than ourselves—something that might help us change the world, we have to join forces for a world in need. Washington National Cathedral—The Cathedral sometimes hosts guest speakers of a variety of faith perspectives, and most sermons are available in video. 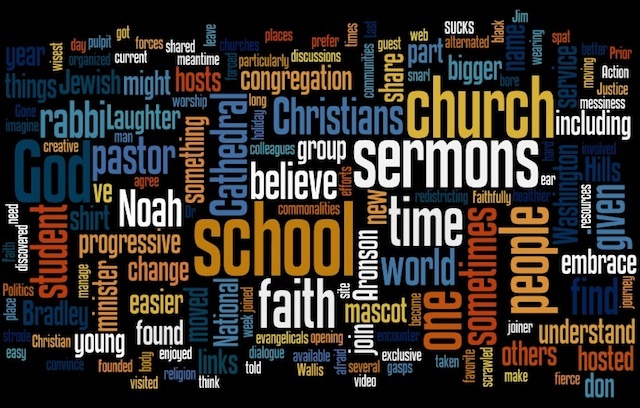 Noah Aronson’s blog—I just discovered this after Noah visited our church. Sojourners: Faith in Actionfor Social Justice—Founded by Jim Wallis, author of God’s Politics, this is a group of progressive evangelicals working together on social justice issues. The Christian Century: ThinkingCritically. Living Faithfully—This is a magazine for progressive Christians that hosts links to many blogs. Please share the gems you’ve found that have given you insights into yourself and others and, ultimately, into the Spirit that is in us all. Previous PostMasculine? Feminine? Neutral? Or Just Confusing?Next PostWhat Do I Say to Arizona Christians? Why bother? Religion is so boring. If you want to do politics, you can do it without having to sing boring songs and getting up early on Sunday mornings.